How could he miss that putt? A mental error? Perhaps. A heart-breaking ending? For sure. 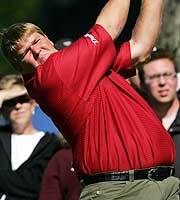 Does it change the way that we love John Daly? Not really. 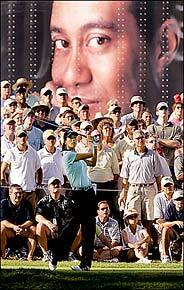 After all, he did out drive the un-out-drivable, Tiger Woods on that first playoff hole. A heroic golfing feat in itself. I guess it’s time for another comeback, eh, John? You proved that you’ve got the right golf stuff. You also showed more than ever that you really are like me. It’s something that I might have done. But I’ll use the experience not to do it… Please God! Or, you may also want to check out Tim Kawakami’s hearfelt rendition of the WGC-American Express Championships tragic ending in San Jose’s Mercury News. She already has won. Not that I think she’s going to take all that endorsement money and run, but anybody who doesn’t think she’s going to prove herself on the LPGA as well as in a lot of other places, can step right up and I’ll take their bets. She’s a genuine star with genuine talent, a joy to watch, and with blessings such as she posseses, there’s no way she can be denied the winner’s circle. http://www.combridges.com/wp-content/uploads/2017/06/ComBridges-Logo-300x60-300x60.jpg 0 0 JonLeland http://www.combridges.com/wp-content/uploads/2017/06/ComBridges-Logo-300x60-300x60.jpg JonLeland2005-10-04 23:33:002005-10-04 23:33:00When Will Wie Win? Uh-oh. Two back-to-back golf posts… Well, on one hand, I’m interested in Michelle Wie from the sports business point of view… Specifically, how does a 15 year old who has never won a professional tournament become that highest paid woman golfer in the world? And, on the other hand, I love her from the “spiritual roots” in Hawaii passion and enthusiasm that I share with many golf fans, especially those from Hawaii, for this young, charming charismatic star. Or maybe it’s just because she has one of the most beautiful golf swings that I’ve ever seen? Or the fun of seeing a 15 year old girl beat seasoned professional male players? Anyway, she’s a treat and makes the great game of golf even more fun to watch. I personally hope she gets to live her dream and play in the Masters. If you’re interested in more details, here’s a good overview of Michelle Wie’s apparent decision to turn pro very soon.